The two-day-long nationwide strike called by major trade unions against the alleged repressive policies of the NDA government has thrown life out of gear in several states. The strike is also quite visible in other states like Assam, Odisha, Meghalaya, Karnataka, Manipur Bihar, Rajasthan, Goa, Punjab, Jharkhand, Chhattisgarh and Haryana. The central trade unions during the convention held in September 2018 had given the call for a nation-wide strike accusing the government of “arrogantly ignoring” the 12-point Charter of Demands on minimum wage, universal social security, workers’ status and including pay and facilities for the scheme workers, against privatisation of public and government sector including financial sectors. Laying out their demands, the convention at the time also denounced the “communal and divisive machinations in society being carried on with the active patronage from the government”. Thanks for following the live updates. For the latest news and updates, please visit Zee News. Members of the Indian National Trade Union Congress (INTUC) protest inside Maidan metro station in Kolkata in support of the two-day nationwide strike called by Central Trade Unions demanding minimum wages and social security schemes among others. 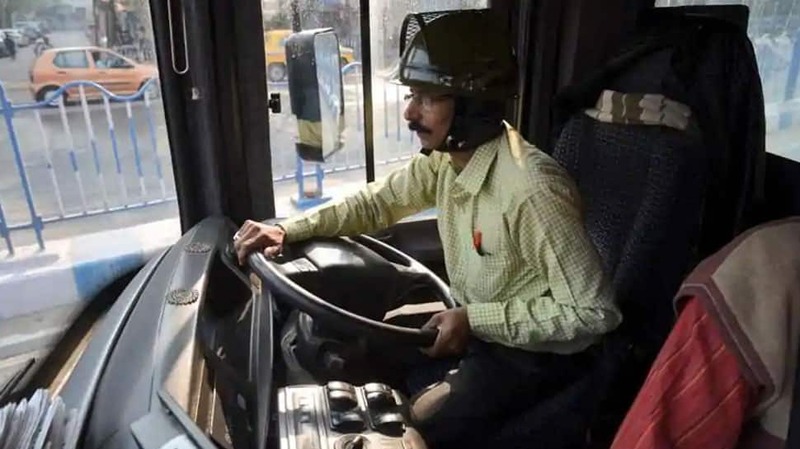 Buddhadev Bakshi, a driver of Calcutta State Transport Corporation (CSTC), clicked wearing a helmet given by the department fearing attacks during the two-day Bharat Bandh called by trade unions, in Kolkata. Kerala State Road Transport Corporation (KSRTC) is not operating buses in the state, while train services have also been delayed and disrupted due to the Bharat Bandh called by trade unions, says reports. Delhi: All India Central Council of Trade Unions (AICCTU) members hold protest in Patparganj industrial area against privatisation of public and government sector and demanding minimum wages, social security among others. In some states, the transport department, taxi drivers and auto-rickshaw drivers have gone on strike for two days while Railway workers are holding gate meeting bearing black badge to express their solidarity, says Amarjeet Kaur, AITUC. The strike is quite visible in Assam, Meghalaya, Karnataka, Manipur Bihar, Rajasthan, Goa, Punjab, Jharkhand, Chhattisgarh and Haryana - particularly in the targeted industrial areas and different mines, says Amarjeet Kaur, General Secretary of AITUC. The two-day strike is affecting normal life in Kerala. Here are some more visuals from Kochi. West Bengal: Clashes between TMC and CPM workers in Asansol during 48-hour nationwide strike called by Central Trade Unions demanding minimum wages, social security schemes and against privatisation of public and government sector. West Bengal: Central Trade Union protests underway at Rupsa, Jaleswar and Datan in Bhadrak- Kharagpur railway section and Raghunathbari in Haldia railway section, reports ANI . Odisha: Members of Central Trade Unions hold protests and block commuters in Bhubaneswar demanding minimum wages and social security schemes among others. Central Trade Unions have called a 48-hour nationwide strike over several demands. West Bengal: Police in Kolkata detain CPM workers protesting in support of 48-hour nationwide strike called by Central Trade Unions. Their demands include minimum wages and social security schemes among others. Here are some visual from Karnataka's Hubli where 48-hour nationwide strike called by Trade Unions, demanding minimum wages, social security schemes and opposing privatisation of public and government sector organisations, has begun. 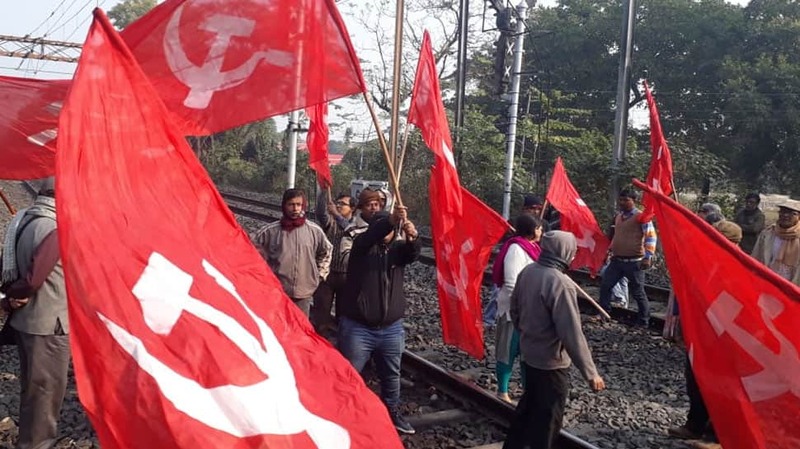 In West Bengal, members of Central Trade Unions block railway line in Howrah demanding minimum wages and social security schemes among others. In Assam, central trade unions have called a two-day nationwide strike demanding minimum wages and social security schemes among others. Here are some visuals from Guwahati. Key services like banking, transport etc are likely to be affected across the state due to two-day strike by trade unions. The trade unions have supports of almost all major independent federations of central employees, state employees and the employees of banks, insurance, telecom, and other service sectors representing the workers and employees of all the industries and services including transport services, both in organised and unorganised sectors. According to reports, nearly 20 crore workers of the state and central government are expected to join the nationwide strike which has been called by 10 trade unions. Farmers' unions like All India Kisan Sabha (AIKS) cand Bhumi Adhikar Andolan are also part of the strike. The strike has been called by a consortium of ten central trade unions and has received support from organisations like the AITUC, CITU, HMS, AIUTUC, TUCC, AICCTU, along with employees in the banking and insurance sector. The 48-hour-long strike is likely to have a major impact in Left-dominated states of Kerala and West Bengal. A two-day-long nationwide strike has been called by ten major trade unions against the alleged repressive policies of the Narendra Modi-led union government beginning Tuesday.